Outside things are starting to melt, starting to look more like Spring. With the change in season and the change in temperature, it has me inside getting started with my Spring cleaning and organizing. Spring cleaning in our house is doing all the major jobs we didn't do on a regular basis in the winter. This year I am getting things started by adding the line-up of Gain scented products to my Spring cleaning routine thanks to P&G! Upholstery like curtains, carpets, material sofas and so forth can be freshened up with new Febreze Fabric Freshener in Gain scent to eliminate unwanted odours. I do this on a regular basis having pets and kids who frequent the living room. It really helps freshen things up. Closet clutter can be organized into bins or storage vacuum bags to make room for spring and summer clothing. Keep your winter clothes smelling fresh with Gain Fireworks scent booster in your laundry loads and use Febreze Fabric Freshener when its time to take them out again. I love using the scent boosters for towels as well, they can stay fresh up to 12 weeks so the ones at the back of the closet are just as fresh as the others! Tackle areas of the house that tend to collect dust like baseboards and blinds with Swiffer Dusters. Swiffer Dusters have replaced any other type of dusting tool in my house (except wood polish because my dining table and coffee table need the extra TLC). They take the chore out of dusting by collecting and trapping dust and dirt, throwing it away with the disposable duster afterwards. Get down into tough to clean places with the Mr. Clean Magic Eraser. Remove marks like scuffs, crayon and oily finger prints from surfaces within seconds. I like Mr. Clean Magic Eraser for every day use in the kitchen and bathroom as well. Those are two of the most lived in spaces of the house and tend to get dirty quickly. It's great to have something that works quickly and efficiently to get the job done. Visit www.MrClean.ca for more about Magic Eraser and other great cleaning tips! Keeping the floors shining between major wash-downs is easy now with the Swiffer Sweeper and Swiffer Wet Jet. With dogs and kids tracking dirt through the house during this time of year, it's handy to have something you can grab and clean up a mess quickly without having to whip out the old broom and dust pan or mop and bucket. 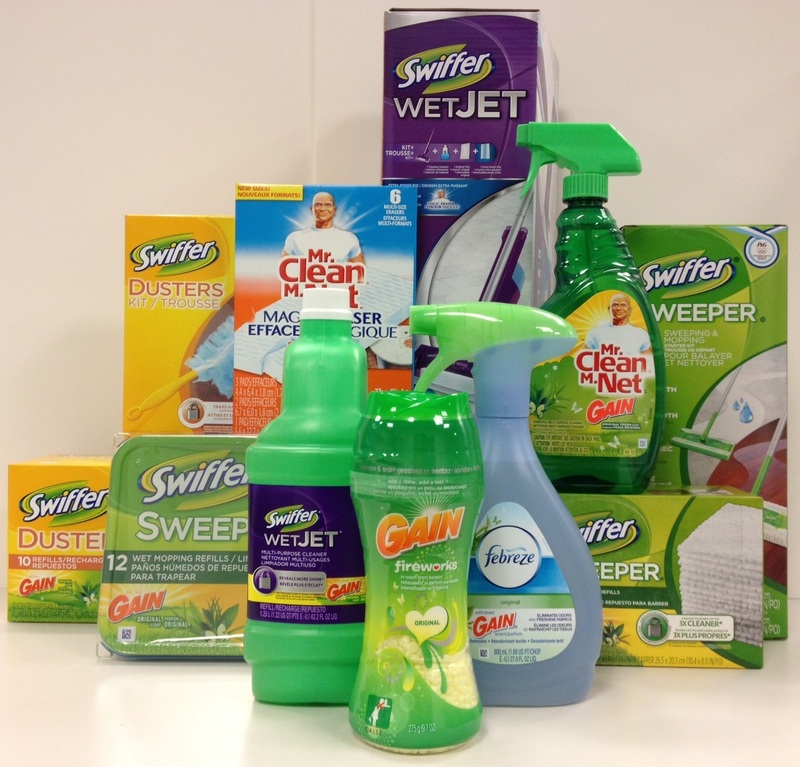 Swiffer gives cleaning a whole new meaning with new Gain Scent for both the Swiffer Sweeper dry, wet and Swiffer Wet Jet! 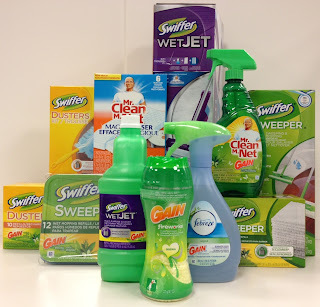 With these and other great products from P&G our home is more cleaner and fresh smelling than ever! For more information about Gain and new Gain scented products please visit the website www.ilovegain.ca or the Gain Facebook Fan Page! Please fill out the Rafflecopter ballot below following the terms and conditions stated. Giveaway ends April 30th, 2013. I'm looking forward to trying the Swiffer Wetjet with Gain Solution. I love my Wetjet, but I hate the way the solution smells. This sounds like just the ticket for me. I think the spring cleaning chore I need to tackle is washing the walls. Ick. the magic erasers and I would like to clean out all the kids old clothes and toys. I want to try the new Swiffer WetJet with Gain. I love my Swiffer products! I can't wait to spring clean the family closets - goodbye winter clothes! A new swiffer wet jet with gain would be awesome. Spring cleaning for me needs to start in the office. Paper everywhere! fireworks scent booster! i love to keave my blankets & towels smelling amazing! I'm most looking forward to trying Gain Fireworks Original Scent Booster because I have tried most of the other products. I am wanting to clean my blinds! Most looking forward to the NEW Swiffer WetJet with Gain Solution because I've never used a WetJet and having Gain included with it, I can imagine how clean and how good it would smell! I'm looking forward to going through my fridge! lol I always find some goodies in there that need to be chucked out! I'd like to try Gain Fireworks Original Scent Booster. I need to tackle all the clutter that has collected in the office. Not looking forward to that. UGH! I want to try the Swiffer Dusters to see if they are better than traditional dusting.. The NEW Swiffer WetJet with Gain Solution would be helpful in tackling my floors in the kitchen and bathrooms! I need to clean the basement...ugh! I'm most excited to try the Swiffer Duster Kit because with 6 cats, we get dusty fast. I need to tackle my bedroom. I'm looking forward to trying the Gain Fireworks Original Scent Booster because I love the scent of gain! A spring cleaning task that needs to be tackled is washing all the windows. fireworks booster and magic erasers love those things!!! The Mr. Clean erasers are my most favourite cleaning product, they truly are remarkable!! My windows need a good cleaning inside and outside. The Mr Clean erasers are great. Select-a-size is a fantastic option. They'll help me clean the bathroom... my most hated job. I'm looking forward to trying the Gain Fireworks Original Scent Booster. I need to take my curtains down and wash them and I think this product would help them smell fresh and clean longer. I am excited to try the Swiffer Duster Kit because I've been lazy with the dusting over the winter so the disposable duster refills would come in super handy to get that layer of winter dust gone! I really want to try the Swiffer Dusters because all the ceiling fans need to be dusted as well as the exhaust fans in the washrooms! I'm looking forward to trying the Select a Size Mr. Clean Magic Eraser. Many times you only need a small portion of it for cleaning a particular thing, so I think this new option is smart. I can hardly wait to get the windows cleaned, they are grubby from all the dust & dirt. I'd love to try NEW Mr. Clean with Gain Spray, looks like an awesome combination of making a house clean and fresh smell. My Spring Cleaning task is windows, it's time. I would like to try the Mr. Clean with Gain Spray. The spring cleaning that I would like to do is clean the windows inside and out. After the winter they got dirty. I can't wait to try the dust and shine, I need to dust my house top to bottom! I'd love to try the Swiffer WetJet Kit - it seems like such a simple, handy item to quickly clean up spills and dirty footprints etc. for spring cleaning, i really need to get going with getting the windows clean. Want to try Gain Fireworks Original Scent Booster because I want to see how nice it smells. I want to tackle cleaning the bedrooms. I'd like to try Gain Fireworks Original Scent Booster! I can't wait to put all the winter clothes away and get out the spring/summer ones, especially my sandals! I want to try the Gain Fireworks Original Scent Booster the most. I've already started my Spring cleaning last month. I still have lots to do yet. I want to get the winter clothes washed and put away next. Swiffer Duster Kit because I hate dusting. Really need to do a good spring cleaning on the basement. The Gain products because Gain smells so good! I really to to tackle the dusting with a swiffer dusting kit and cleeaning the walls with mr.clean. spring cleaning - the garbage that has flown into my backyard during the winter...i seriously cannot believe how much there has been this year!!!! I am most lookjng forward to the NEW Mr. Clean with Gain Spray..I love Mr clean,and with the added Gain smell,it sounds great! I'm most interested in trying the Swiffer Sweeper Kit. My spring cleaning task that I'm eager to do is clean the exterior of my windows. I'd like to try the Swiffer WetJet because I've got two messy little ones and a lot of floor that I've got to try and keep clean! I'm looking forward to getting the windows cleaned this spring. The Swiffer Sweeper with Gain Wet Refills would be great. The kitchen and bathrooms are in serious need of a good mopping!! I am looking forward to the Mr. Clean magic eraser select a size because I've heard so many amazing things about the magic eraser. For spring cleaning, I need to clean out our storage and purge some stuff. I would most like to try the Swiffer WetJet Kit because it takes me a long time to wash my floors. For spring cleaning I want to tackle cleaning off the deck outside. I would love to try the Gain! The windows because they are so dirty! I'd most want to try this: Gain Fireworks Original Scent Booster as I am curious how it will make the laundry smell. I need to tackle all the closets...they are stuffed, especially the front coat closet. Also need to clean the windows. I'm excited for the swiffer! And putting the winter clothes away! I would like to try the Swiffer with Gain. I most want to try the Swiffer WetJet Kit. Have never tried it before. I am most anxious to clear the clutter in the bedroom, and get to the floors. I'm most interested in the NEW Swiffer WetJet with Gain Solution because it would be great for keeping our front entrance floor clean. For Spring cleaning, I'm most wanting to tackle organizing and cleaning our storage room in the basement. I would love to use the Swiffer wet jet because this time of year in BC it is very rainy.. = a lot of mud..!! Ekk i need to tackle organizing the basement! !